lots of place to rent under 300 ruppies and many view restaurants trying to persade you into dinning on their delicious but slightly overprice (for india 3-4$) meals but fresh from the sea prawns fish and squid! English (Traduisez ce texte en Français): lots of place to rent under 300 ruppies and many view restaurants trying to persade you into dinning on their delicious but slightly overprice (for india 3-4$) meals but fresh from the sea prawns fish and squid! Try looking... - If you turn up at a beach resort in the two smallest swell months of the year and don't look beyond your nose then don't be surprised if you don't find a wave! Check the charts, scour the coastline and be prepared to travel and you'll find great, empty, virgin waves in this area. In the last year I've discovered and named two waves of real quality... Don't believe the hype. YEs for surfing! - I just come back from few days over there surfing! The main beach it is not for surfing (that's true) but after the cliff, if you paddle around until you are in front of Clafouti restaurant, you'll find every morning a Really Really nice left, that at the midle of the ride, the wave gets really hollow and so you get Barrrel! Its a really nice Wave! I Call it The Point! You can get Really nice waves, with no one (NO ONE) in the water! I'll post some pics naming the place (The Point) so you know what i mean! 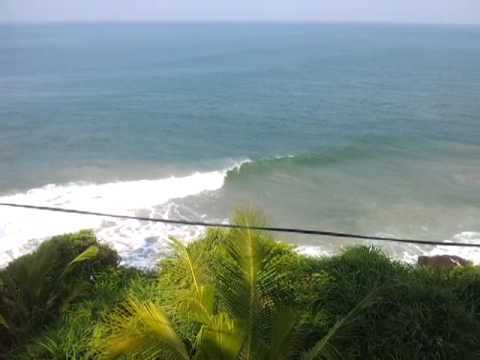 Don't go for surfing - Varkala is a beautiful village with a nice beach and waves...but NOT FOR SURFING!! I was there two months, december and january and I surfed just 5 times. Wave should be beautiful but close together and you cannot ride more than 2 seconds... You have no chance...even if you are a very good surfer. Each wave you try to surf you can destroy your board. Climate and people in Varkala are very nice.....but this is not enough to go there again!!! !